Over the past few days I’ve been involved in some very deep discussions around how to make web visitors buy. In my opinion it doesn’t really matter if it’s the web or the real world – People Buy Benefits. The ad didn’t rotate or animate. The above image was all there was. Would you rush over to their site? Not such a compelling ad. I guess they are limited by the legal part of things, on what they can put in their ad, but this image seems very wordy, no call to action, no eye catching features. The fact that they have the URL in a font (size and color) that is similar to other text doesn’t really help either. I wonder what the CTR on this is. I hear what you are saying and agree about the ad. By coincidence, I actually got a demo off these guys at Toys4BigBoys in the RDS last weekend and I quite liked their app. I was going to research more into their product and maybe give it a test run. Back to the ad… I’d be interested to know if the image is a gif file. Sometimes when you supply your ad to companies to use on their site, it will get corrupted somehow and it will cycle your ad slides once only or will show the last slide in the set. What you’ve shown above seems to be the last in a slide set possibly. It looks like a health warning! @Martina – that type of stuff absolutely fascinates me. Been working with some larger MVT stuff, and it always amazes how small changes can have big impacts. @Paul – I imagine the conversion (by any metric) must be piss-poor. @David – cant remember, think it was a gif, but it definitely didn’t animate. Even if this is some issue it might make sense for them to QA some of their collateral. It reminds me of the story of the owner of a shop selling hand made necklaces. Sales were slow so they left an instruction for the sales assistant to reduce the prices. However, the assistant misread the instructions and INCREASED the prices. They had the best sales ever. The reasoning is that when the necklaces were priced lower shoppers percieved that they were poor quality. With the higher prices shoppers percieved them to be better quality and more desirable. Funny how things work out sometimes! What an awesome find! It’s like “you probably shouldn’t do this, but be an idiot anyway and click here.” Whoever put this up ought to be sacked. I will share this at our New Years’ party. Pure comedy. But, you absolutely must give them credit for a rare instance of “Truth in Advertising.” My guess would be that is some sort of legally required disclosure. Though, I think we all agree it would better serve them “disclosing” that in fine print at the bottom of the ad. And, by the way, Richard, still haven’t heard details on your shutting down the servers. I’m guessing your going to write a book and stop blogging for a while. ??? But, please don’t shut down RedCardinal. It’s gaining momentum. No? Let some of your fans fill it with content in the interim. Love it! Honesty is the best policy as they say and they have take the KISS principal to its core. Definetly Kept is Short and Sweet. 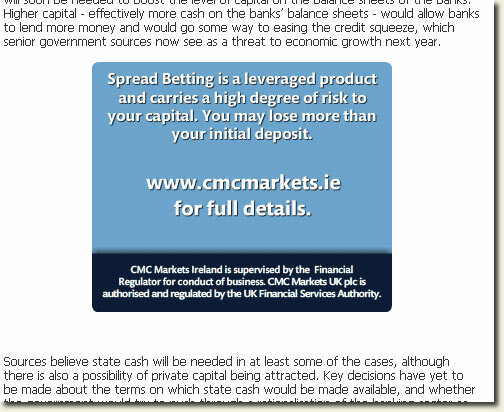 May be they were taking the gamblers… plenty of them out there in the UK with the banks paying a pittance on savings and labour wanting to gamble with our savings!